Case Study: Vancouver Real Estate, Can Prices Go Any Higher!? 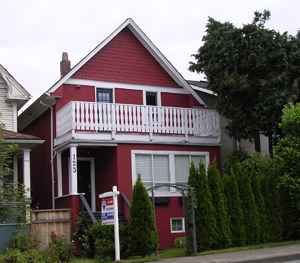 The Property: A 2200 sq.ft., 3 level “character” house containing 6 bedrooms, 4 bathrooms and 3 kitchens on a 24.75’ X 112’ lot on West 12th (busy street) in the City Hall area of Vancouver. Built in 1910, the building is structurally sound, with partially upgraded plumbing, electrical, and cosmetic work. The accommodation is Top floor: 1 bdrm suite; Main floor: 2 bdrm, 2 bath suite; and Basement: 3 bdrm suite; plus single car detached garage with electric service. The Revenue: At closing, the house was delivered vacant. Area rents indicated that the monthly revenue should be Top floor: $1,100; Main floor: $1,500; Basement $1,550; Garage $250 = total of $4,400/mo or $52,800/yr. An expense ratio of 25% or $13,500/yr, gave Net Income = $3,300/mo or $39,600/yr. The Sale: The Property was listed for $845,000, reduced to $799,000, and sold for $803,500 in August 2010, after 45 days on the market. The Analysis (2010): Financing @ 3.6%, 5 year term and 25 year amortization was available. If the Buyer put down 25% ($216,000 including closing costs), the mortgage payment for $602,600 was $3,040/mo or $36,500/yr, giving a modest positive cash flow. Assuming an average annual net income increase of 3%, the 1st, 5 year-end holding period should give the Buyer’s financial position as: Mortage Balance=$520,900, Net Income= $3,825/mo or $46,000/yr. This change in financial position provides “Mortgage Rate Insurance” for the Buyer, so that interest rates could rise to 7.5% before increased mortgage payments would cause the Buyer to be out of pocket and “feed” the investment - or be forced to sell it. The Update (Dec 2013): As noted, this property sold in August of 2010, and is still owned by that Buyer. Presently, 3 years later, the property generates $5,000/mo (estimate $1,650/mo for owner’s main floor suite), with a 25% expense ratio, current net income = $3,750/mo or $45,000/yr - a compounded increase in net rental income of 4.35% since purchase date - better than predicted. At purchase in 2010, the Assessed Value was approximately $720,000; the 2013 Assessed Value for the house is $910,000, for an annual, compounded increase of 8.12%. If the 9% “historical” appreciation factor is applied over the 3 years, the computed market sale price would be $1,040,000 today, giving a 4.3% cap rate - a feasible likelihood. This deal was available for anyone in mid 2010. It is likely that there are properties available today that provide the same opportunity for Buyers.